Students at Perth College teamed up with Show Racism The Red Card Scotland to organise a 7-a-side football tournament at McDiarmid Park and information raising event on the campus on Monday 7 March 2011. ‘Show Racism the Red Card’ uses top footballers to educate against racism and sectarianism and the inclusive event was funded by the Perth and Kinross Community Safety Partnership and supported by Perth & Kinross Council as part of their continued partnership agreement with Show Racism the Red Card and St Johnstone FC. The event was also supported by Perth College UHI, NHS Tobacco and Safe Choices, Tayside Fire Brigade and Perth College UHI Students’ Association. NHS Tobacco and Safe Choices project organisers also promoted healthy choices with their 'Quit 4 U' stand, encouraging smokers who would prefer to stop, in the same week as no smoking day. The day kicked off with teams of students from across many of the College’s programmes playing in the football tournament, followed by a presentation ceremony and a campaign film and panel event. 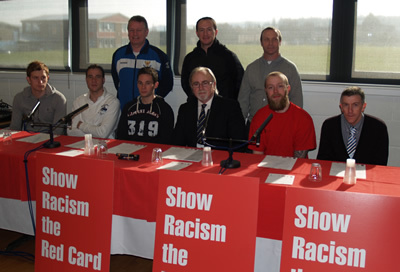 St Johnstone players were in attendance along with a panel consisting of Show Racism the Red Card organisers, Councillor Elspeth Maclachlan and Perth College UHI Principal and Chief Executive, Dr Thomas Moore. For more coverage on this event please see here.